My one greatest weaknesses in life? Nut Butter. Almond butter, peanut butter, cashew butter… you name it and I love it. …Awww who am I kidding, I eat an indecent amount anyway. So just imagine my excitement when I get to add nut butter to a main course. Preheat the oven to 350 degrees and place pine nuts in a metal tin. Place in the oven for 10 minutes, or until golden brown (CHECK OFTEN TO PREVENT BURNING), stirring halfway through. Set aside to cool. 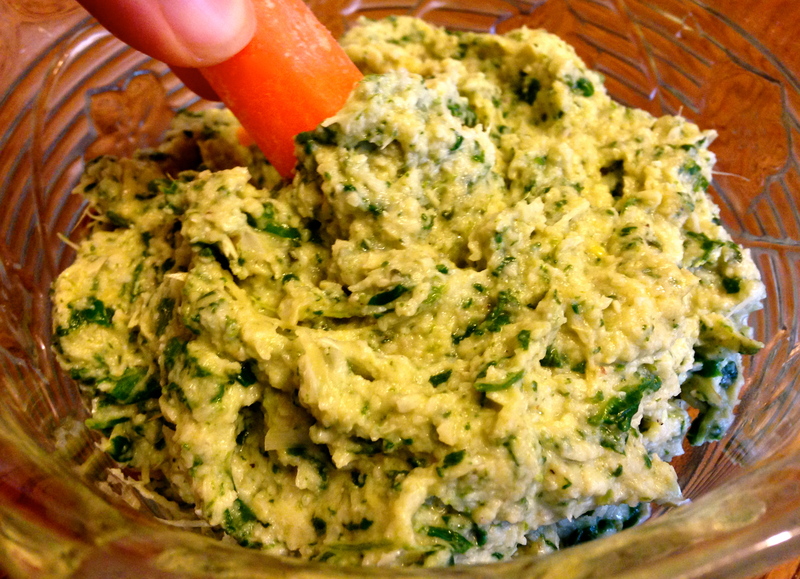 Combine all sauce ingredients in food processor. Set aside. Heat coconut oil in a large skillet. Add in onion and sauté for 5 minutes. Add in spinach and mushrooms, cooking until spinach is wilted. Add in cauliflower and let cook for an additional 5 minutes, stirring every so often. Meanwhile, cut broccoli into florets and steam until desired softness. Once finished, pour cauliflower mixture into a bowl. 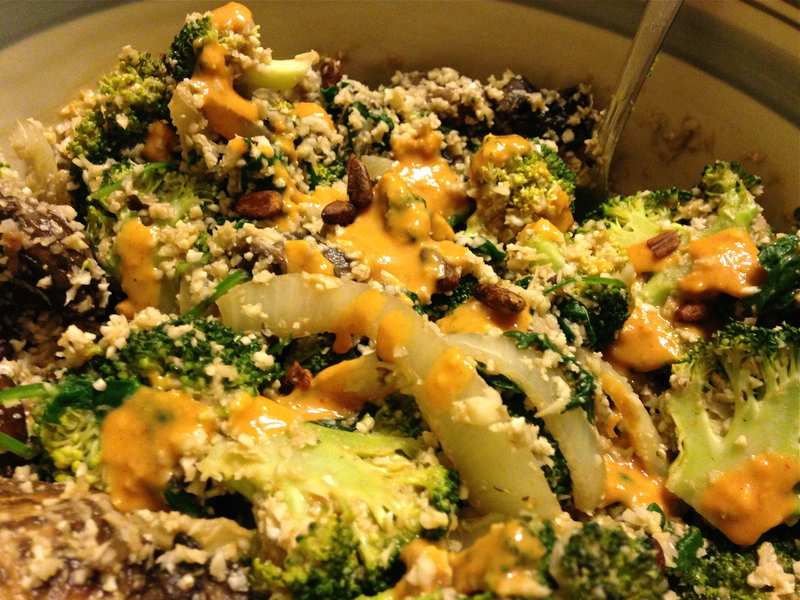 Add in broccoli and sauce and mix altogether. Top individual bowls with toasted pine nuts. In a sad attempt to honor Earth Day (this Wednesday, people! ), I am sharing this spinach and artichoke dip. The artichokes are mashed up to form a hummus-like base for this recipe. See the intentions of my creation now? But seriously, I cannot think of any naturally blue foods that would give something a blue color (blueberries don’t count either- they bleed violet). Combine artichokes and olive oil in a food processor and blend until smooth-ish. In a pan, add avocado oil and garlic. Sauté for 1 minute. Add in onion and sauté for another 3 minutes. Add in spinach, cover with a lid, and place on low heat. Cook until spinach has wilted. Transfer pan contents into food processor and pulse (just until spinach is broken up). Add salt and pepper and serve! I hope everyone’s not too tired of eggs yet with Easter just passing! Knowing that Easter was approaching, my dad stocked up on eggs (more than usual) in fear that they would all be sold out at the stores. So now we have a good 10 dozen eggs. Meaning, I’m “allowed” to use and eat a bit more than I usual am- yay! Preheat the oven to 400 degrees and oil muffin tins. 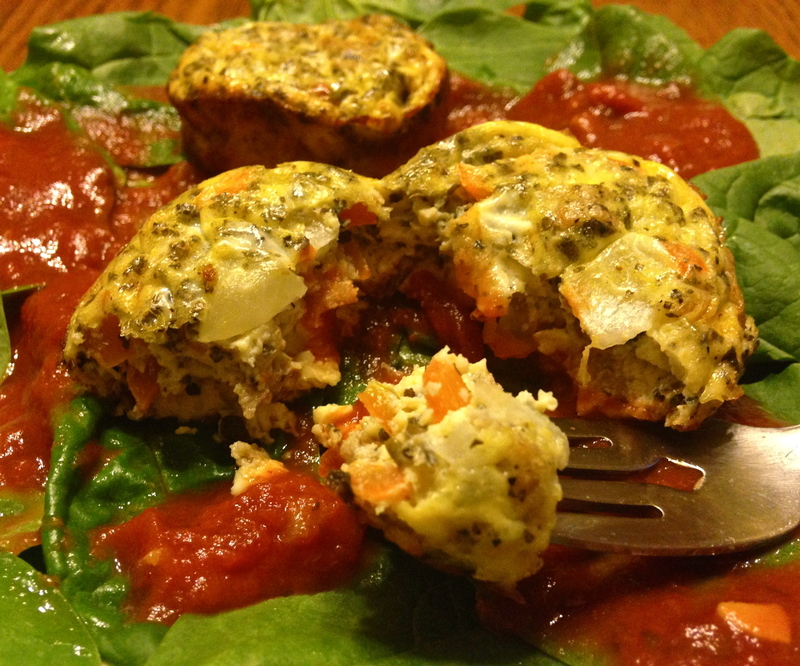 Combine all the ingredients together (except the sauce and spinach) and pour into tins. Bake at 18 minutes. If desired, serve over marinara sauce and spinach. I know, not a totally original post, but tomorrow is Easter and Easter calls for peanut butter chocolate eggs! Anyway, the last time I tried to relive my childhood and eat one, I found that it was waaayyyy too sugary for me and I actually felt nauseous soon afterwards. So, I now make my own! And who knew it would be so easy?! And I can feel good about eating these (both mentally and physically) because they don’t contain chemicals x, y, and z. In a bowl, combine peanut butter, vanilla extract, and salt. Add in protein powder and coconut flour and mix together. Form into a dough ball with your hands (if the dough sticks to your hands add a 1 tsp of coconut flour or protein powder at a time until it stops). Tear off small pieces of peanut butter, roll into desired egg size (I make regular-sized ones and mini ones!) and place on a wax-covered baking sheet. Place eggs into the freezer. Meanwhile, melt chocolate chips and coconut oil together. 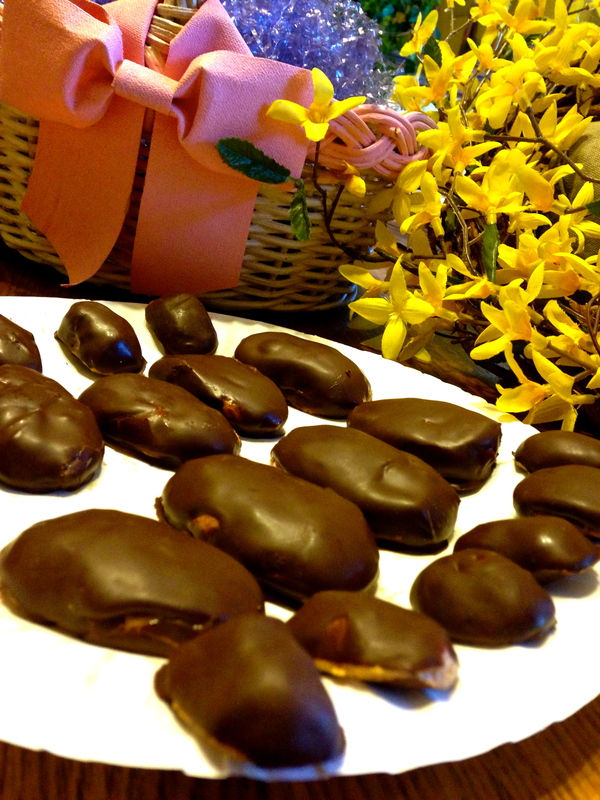 Once eggs have been in the freezer for 15 minutes, take out and dip in chocolate, coating in a thin layer completely. Once all eggs have been coated, place back in the freezer for 5 minutes. Afterwards, dig in! To store, keep in the refrigerator.